Amelia, the Naked Bacon Mascot! A blog post that isn’t about bacon? Well, in a way it’s about bacon… because really, isn’t everything is about bacon? Naked Bacon, that is. 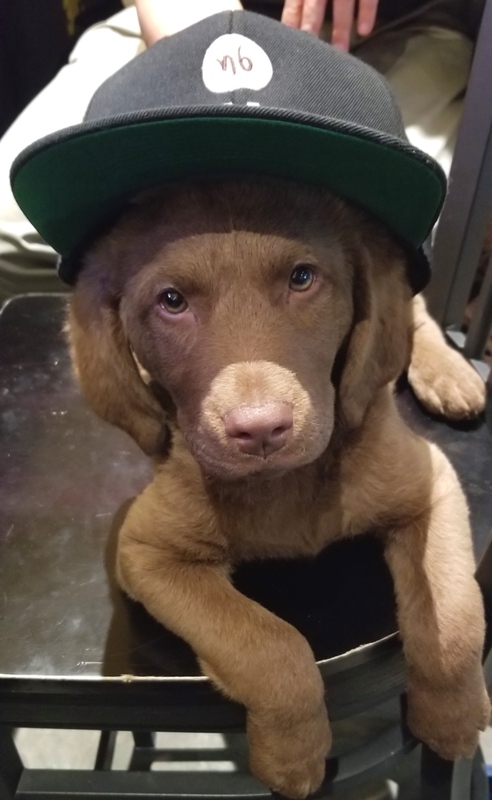 When we found out that today is National Puppy Day, we just couldn’t let it go by without sharing about the newest member of the Naked Bacon family, our sweet Chesapeake Bay Retriever pup, Amelia! Amelia wearing her Naked Bacon hat! She’s always the first one to come running whenever we’re cooking up Naked Bacon, so we think she’s crowned herself our official mascot! It seems her favorite flavor is Original Bacon, although it seems like it might be an even tie between it and our Sugar-Free Links (in fairness, that’s a tough choice to make for anybody! )… and can you tell we’re completely smitten with her? Amelia snuggling with our CEO, John Kreilich! We hope you’re celebrating the four-legged friends in your life who make every day so much fun! In the comments below, tell us about your furry friends!